Bunions | WILL I EVER DANCE AGAIN? Many girls (and their mothers) are concerned at the idea of going onto pointe, and the possibility of developing unsightly and painful damage to their toes. This is a very real and valid concern! While pointe work does not cause bunions in most people, if pointe is commenced too early, or if there is a family predisposition to getting bunions (especially on your mother’s side) it may increase their development. Some people are more predisposed to develop bunions than others, and there are plenty of people in the world who have bunions and who have never done a days dancing in their life! Let’s start with a little discussion on what bunions actually are. A bunion forms when the first metatarsal (the major foot bone that attaches to the big toe) angles away from the foot, and the toe itself angles in towards the foot. A painful bony lump develops at the base of the big toe which can become quite red and inflamed. Often the range of motion in the big toe becomes restricted and even working on demi pointe is difficult. The major contributing factor to the formation of bunions is rolling in (pronating) especially if you over-turn your first position from your feet. So many students try to cheat turnout by screwing their feet out, and all it does is put pressure on your feet and knees! Make sure that your little toe joint has as much contact with the floor as your big toe joint when standing in any positions. Another common factor is the tendency to lean on the big toe in a tendu, especially to second or derrière. Constant pressure on the side of the big toe will tell it that you want it to grow inwards! This can happen whether working in flat shoes or in pointe shoes. I have seen bunions forming in girls as young as 8 years of age! However this particular girl responded so well to the exercises in The Perfect Pointe Book that in just two weeks her teacher was noticing real changes in her feet. When we make the transition onto pointe, the amount of pressure on the toes does increase the risk of developing a bunion. 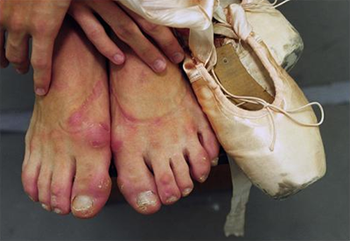 This is why the strengthening of the feet is so important before progressing onto pointe. If you do not have enough strength to hold yourself up in the shoe, the shoe will twist on your foot and cause the big toe to twist, increasing the strain on the big toe joint. Correct placement is possible only with strong feet, hips and core as well as carefully chosen shoes. It is very important to have a professional fitting, especially for your first new pair of pointe shoes. This is especially important through the box area (the front of a shoe). You must always ensure that the ‘wings’ of the shoe come up to the level of the big toe joint. If the wings are too short, then the big toe is squeezed in towards the other little toes and the outside of the joint is stretched. If the shoe is too wide, your foot will slide down in the shoe, squashing your toes, and if it is too narrow, the big toe will be squeezed in too far even in standing. If the box is the wrong shape, your foot may be compressed sideways but still have room above the toes. Try to find a store where they have lots of different shoes and don’t worry if you have to spend some time finding the right shoe. It can make all the difference to your dancing!If you already have signs of a bunion developing, it is very important to gain as much strength and control in the area as possible before going en pointe. It is possible to reverse some of the changes in young feet, however as we get older this becomes harder to do. Careful padding and taping can help ease the pain of bunions that have already developed, and hands on treatment, combined with taping and padding can actually reduce the size of the lump. Pressure directly over the bunion may actually increase the pain, so try using a “donut” of foam around the sore area to off load the pressure on the outside of the big toe. Click the button below to purchase the full injury report!